This Schlage Multi-technology Card Reader opens a HES Electric Strike as part of an intricate Door Access Control System managed by Vanderbilt SMS software in another building. One of our recent 2018 projects included using a variety of HES Electric Strikes in conjunction with several Schlage Multi-technology AptiQ card readers. 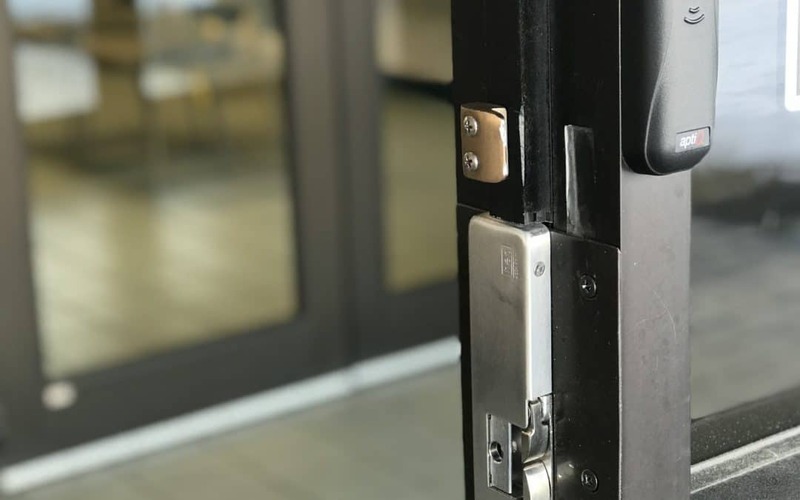 Both of these pieces of hardware work together as part of an intricate Access Control Door Management system, integrated with Vanderbilt Industries SMS software and are one small part of the total access control door management. Sometimes there are many different door operation requirements that must all work simultaneously. A front door can be on a timer, so that it is unlocked during business hours, and automatically locked at a certain hour. An Auditorium may need to be locked at all times, but be operable and unlocked with only certain credentialed personnel. There may be a need for a Schlage card reader that performs a lockdown function. And all of these must be ADA compliant and work with handicap push pad door actuators. You may even have multiple buildings and some in different geographical locations- but don’t fret, these can all be managed at your headquarters, from one location. It can seem overwhelming, but we are here to help you make your door access control decisions. Whatever your needs, we can help you determine which functions are code compliant and compatible with your existing IT platform and door hardware software. If you are looking for a new complete door access control system that is scalable, reliable, or one that can accommodate several types of credentials, including proximity credentials, smart cards, is FIPS compliant or NFC compatible, call us. At FBH Architectural Security, we install all of the door products we sell. 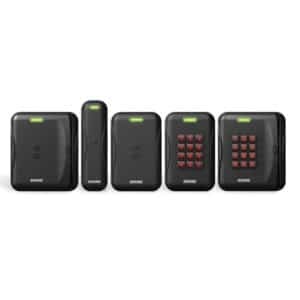 We provide warranty, service, and training on Schlage multi-technology card readers and also sell several types of credentials that can be re-ordered if you need more, such as thin keyfobs, bracelets, necklaces and glossy white cards. Custom artwork and laser engraving is available for all of your custom Schlage card credential needs.